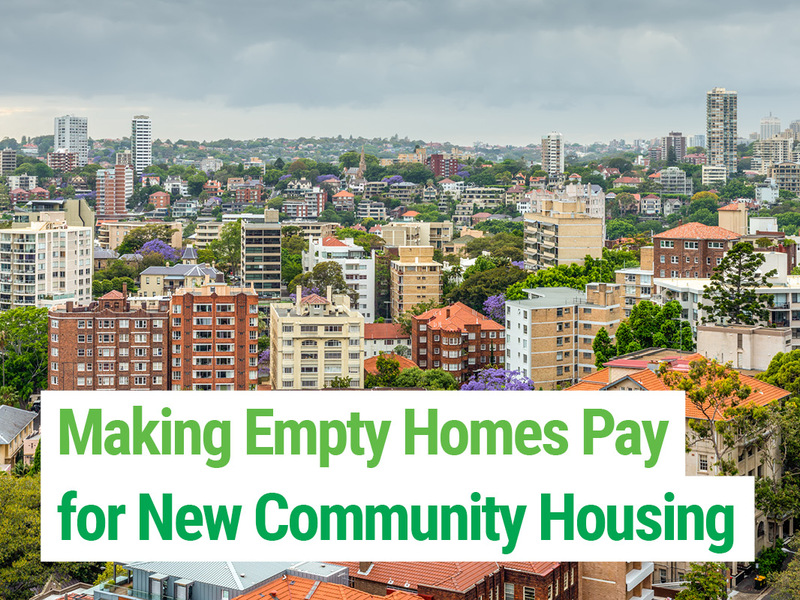 The Greens have a plan to unlock empty homes currently held by investors for capital gains, while producing a robust income stream for councils to build local community housing. In NSW, more than one in ten homes are held by investors and kept empty and untenanted. It results in thousands of empty homes in most council areas and an ever tighter squeeze on the rental market. This needs to change. Many investors do not use their properties to provide housing and obtain rent, but simply as investment vehicles. They seek to gain hundreds of thousands of dollars in capital gains from a rising real estate market while benefiting from the unfair Capital Gains Tax discount of 50%, which the Greens have proposed to phase out federally. This tax break mostly benefits very wealthy investors, who consider rent only a modest additional return that they can do without, especially since it comes with the added bother of a tenant and high tax rates. The most recent census data backs this up. It shows that across NSW there are 284,745 empty homes. That’s more than 10 per cent. Sydney City Council has 11,501 empty homes, Sydney’s Northern Beaches 9,079 empty homes and Blacktown over 5,000. But this is not just a Sydney problem. Wollongong has more than 6,000 empty homes, the Central Coast a staggering 17,221 and Newcastle has almost 6,500 vacant residences. The figures show that too often investors buy real estate and never plan to rent it out. Keeping a house empty maximises their flexibility to sell the property with “vacant possession” whenever they think the market is right. Meanwhile an entire generation is being priced out of ever owning a home. The Greens think this need to change. By creating an incentive for investors to rent out properties, Councils will not only increase the number of homes available for tenants – they can also create a new revenue stream to build community housing. The Greens plan will enable local councils to place an additional levy on empty homes. Councils will work in partnership with the State Government to increase rates for homes that have been vacant for 12 months or more – an Empty Homes Levy. Special circumstances exceptions will be applied if the property is vacant due to death or illness. Councils can identify empty properties as those with zero or minimal water, electricity and garbage use. The proposed Empty Homes Levy will be set by local councils with a maximum rate of triple the ordinary rate. Average residential rates in NSW vary, ranging from approximately $750 to more than $2,500 per dwelling. Given the numbers of unoccupied dwellings across NSW, this could see councils collecting cumulative additional revenue of more than $200 million each year statewide. The Greens will give councils the right to decide if the levy should be applied in their local area, and to set an appropriate rate. Some councils in Sydney will see a desperate need for the levy, others in regional areas will not: we want to empower local councils to decide for themselves. Revenue raised from the Empty Homes Levy will be placed in a trust fund that can only be used to build affordable community housing, and the guaranteed income stream from the levy will enable councils to finance new housing projects. The community housing can be managed either directly by council or in partnership with an existing provider. Revenue from the Empty Homes Levy can be used to obtain low interest finance from the Greens’ Federal Housing Trust. Councils will also be able to take up low interest loans offered by the NSW Government. Once the housing is built it can be rented at fair and affordable rates, delivering additional revenue to build more housing. Councils are well situated to deliver community housing as most have significant land holdings, and are in a position to re-purpose some of these as required. Furthermore, the State Government will also deliver significant additional land to local councils in the next five years via the Crown Lands Act. To deliver this plan we need more Greens elected to local councils. With a strong commitment from Greens councillors and deep community support for addressing our housing affordability crisis, The Greens know we can make this happen. We don’t pretend the Empty Homes Levy alone will fix housing affordability in NSW, but by generating income of more than $200 million each year it will make a significant difference, and every home built makes a world of difference to those who live in it. The primary responsibility for addressing housing affordability lies with State and Federal Governments, not local councils. The Greens’ state and federal housing spokespeople, Jenny Leong and Senator Lee Rhiannon are together working on a detailed policy and pushing for the funding required to fundamentally address the housing affordability crisis. We need root and branch changes to our tax laws along with state and federal budget allocations to seriously tackle the issue on a sufficient scale, but the Empty Homes Levy remains a valuable tool at a Local Government level. Councils already have the land and local knowledge required to provide affordable housing. The Greens’ Empty Homes Levy will finally deliver them the financial means to start building.